If you think the American economy is booming now, just think what it would be like if American collegians had an extra $1.5 billion to spend—especially with President Donald Trump’s tariffs set to raise the prices of imported consumer goods despite he and his administration saying the tariffs won’t result in price hikes. Well, if prices aren’t increasing, tariffs aren’t working. The point of a tariff is to make locally produced products more attractive to local consumers by raising the price of imported alternatives. This, in theory, would result in more local production and fewer imports. But a tariff is paid by the importer of a product, not the exporter. So the 25-percent tariff Trump recently leveled on Chinese imports is transferred to the American consumers of those goods, not the Chinese producers. The trade war isn’t taking money out of the pockets of Chinese manufacturers; it’s taking money out of the pockets of American consumers of Chinese products and Chinese consumers of American products. And since the United States runs a $375 billion trade deficit with China, the only way Trump can “win” his trade war is if Chinese economists can’t do the math to match Trump’s tariffs dollar-for-dollar. It’s even becoming more likely trade with China ends altogether. China has already cancelled planned trade talks with Trump. It is impossible for America to run a trade surplus with China because China produces more products Americans consider essential than America produces for the Chinese, including car, computer and mobile phone components. It’s lower labor costs and Americans’ addiction to consumption allow China to perpetually have the upper hand in a trade war. If an iPhone were made entirely in America, it would cost as much as a brand new car, so while Trump might be making some American-made products more attractive to American consumers, he’s doing so at the expense of American consumers who can’t do without many of the Chinese imports found in their technology and automobiles. Even the Tesla Model 3 can only be 95-percent American-made at most. Since Americans will be paying more for computers, mobile devices and cars, it’s not entirely unreasonable to forgive the $1.5 billion in student loan debt and allow those accepted into college two years of college education free of charge. Students and parents are going to pay more for the devices required to attend college, and colleges are going to pay more for them as well, which will be reflected in tuition costs, which will further increase student loan debt while decreasing consumers’ available income for spending in the American economy, potentially sinking the stock market. There are other reasons besides boosting the economy for the government to payoff student loan debt. First, today’s Associate’s degree, usually obtained in two years at a community college, is the equivalent of a 1980s high school diploma. Advances in technology have made working in what is now a global economy much more complicated and necessitates further education be obtained. Students are not leaving high school with the education necessary to provide for themselves let alone a family, and it’s not their fault. Secondly, with 17 states offering tuition-free college programs, the trend seems to be students at least delaying the accumulation of student loan debt for two years, potentially lowering accrued interest as well as principal loan balances. In short, future college students in the United States will be saddled with considerably less student loan debt than current and past college students. Meanwhile, entire generations (and student loan debt does span generations), are suffering student loan debt and unable to stimulate the American economy by spending money on anything but debt and living expenses. Finally, the collective credit rating of American college students, past, present and future, would receive a boost that could spur entrepreneurial growth and investment in businesses as a whole. America was the land of opportunity, where you could go from “rags to riches” with enough hard work. America used to be the best place to start a small business and be your own boss. That isn’t the case these days because despite incomes increasing for middle-class Americans, their purchasing power has barely budged since 1965. You can’t grow an economy in which most consumers have hardly more purchasing power than their grandparents did over 50 years ago, and consumer confidence in the stock market can’t increase if consumers have no means to express their confidence by purchasing stocks. Lifting the $1.5 billion in student loan debt owed by 44.2 million American borrowers would allow 44.2 million Americans to spend their student loan payment, averaging $351 per month, stimulating the American economy instead of simply paying off interest. Lenders can’t be the only ones making money if the American economy is going to grow. Congress passed a bill Wednesday that makes it harder for consumers to sue banks. The Consumer Financial Protection Bureau’s arbitration agreements rule protected users of credit services from being forced into arbitration rather than being allowed to join together in class-action lawsuits against financial firms with other users who were wronged. Sixty days after Donald Trump signs the bill it will go into effect, providing little protection for consumers when financial firms wrong them in the future. The right of consumers to join together in class action lawsuits is not unlike the right unions have to collectively bargain contracts with employers, so, Conservatives are, of course, opposed. Democrats, on the other hand, are finally ready to pick a fight on the subject of economic inequality. Massachusetts Democratic Senator Elizabeth Warren was at the University of Minnesota speaking on the very subject of economic inequality on Sunday. She’s not happy with consumer protections and regulations of financial firms she championed being undermined by the Conservative-controlled Congress, and she’s ready to pick a fight over it. Unfortunately, she and the Democrats are in no position to fight, and likely won’t be until after the 2020 election -- if at all. The 2020 census will offer an opportunity for Democrats to undo the gerrymandering that has served Republicans so well in state elections since 2010, and it will be just in time for all 435 seats in the House of Representatives are up for reelection. That’s exactly why former President Barack Obama and former Attorney General Eric Holder are spearheading the effort to redraw district lines in 2020. There are states that have taken the mapmaking pen out of the hands of politicians, though. In Washington, California, Idaho, Arizona, Alaska and Montana, an independent commission redraws district lines. In Maine, New York, Rhode Island and Iowa, an advisory commission redraws the districts, but that accounts for just 10 of the 50 states. The rest allow politicians to redraw district boundaries, most of which consist of legislatures that rarely lean Left, so if Democrats want to pick a fight over economic inequality, they’ll have to level the playing field first. If the tax plan presented by Donald Trump and Republicans is adopted, the average American stands to benefit very little. According to a new report by the nonpartisan Tax Policy Center, four-fifths of American taxpayers can expect their after-tax income to increase .5 percent or less, while the top fifth of earners would see a three percent increase in after-tax income. The study also found that 80 percent of tax benefits would go to the top one percent of American earners. Households making more than roughly $900,000 a year would save $200,000 on average. 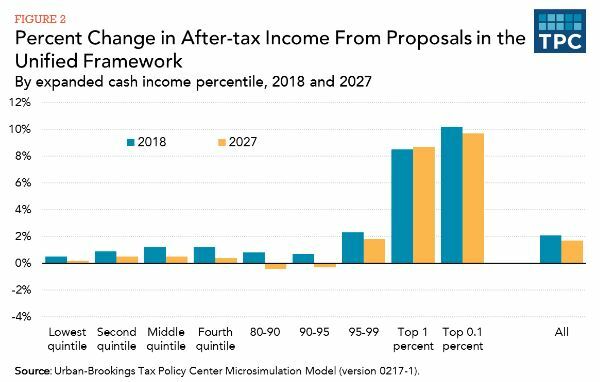 The top one percent of American earners can expect a tax cut of 9.8 percent between now and 2027. Repealing the estate tax would cost the federal government $240 billion in tax revenue over the first decade, most of which would stay in the pockets of the super rich. Big businesses stand to benefit from the Trump tax plan, too, thanks to a decrease of the corporate tax rate from 35 percent to 20 percent. But businesses that rely on debt to finance their investments, like real estate companies, private equity firms and financial companies, will likely see costs increase, because Trump’s tax plan proposes limiting the deductibility of corporate interest. Realtors have been especially opposed to the Trump tax plan, because while it preserves the mortgage interest deduction, fewer people would benefit from itemizing their mortgage interest given the plan’s proposed increase to the standard deduction, which is closer to a 15 percent increase than a doubling of the standard deduction. This could make homeownership less attractive and hurt the housing market. High-tax states like New York and California would be especially affected by Trump’s plan to eliminate the state and local tax deduction, which allows taxpayers who itemize to deduct property, state and local taxes. Congressional Republicans in high-tax states have already expressed their concern, so Trump’s tax plan might not pass without the state and local tax deductions being preserved. Who is paying for these tax cuts for businesses and the super rich? The Tax Policy Center found that a majority of households earning between $150,000 and $300,000 would pay more in taxes under Trump’s tax plan, as would almost 30 percent of Americans earning between $50,000 and $150,000 annually. Trump’s tax plan also doesn’t come in under budget. The tax plan would increase the deficit by $2.4 trillion over the first decade, and by $3.2 trillion over 20 years. And while the Royal Bank of Canada thinks Trump’s tax plan will raise gross-domestic product by .5 percent annually, even if that were sustainable over the next 20 years, Trump’s tax plan still increases the federal deficit by $1.252 trillion.